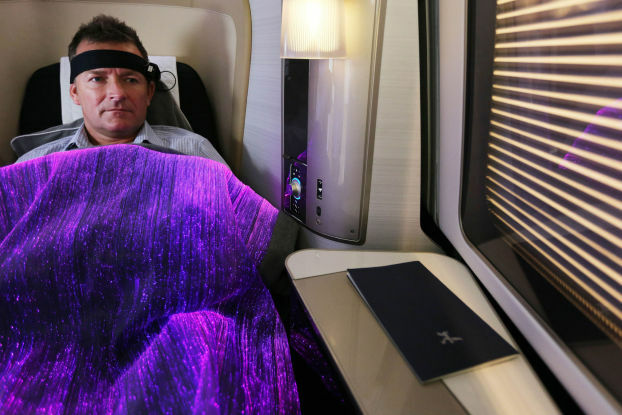 British Airways has begun testing a hi-tech blanket which changes colour using brainwaves, to ensure it offers customers the best flight’s sleep in the sky.The British Airways happiness blanket, which is woven with fibre optics, uses neuro-sensors to measure a person’s brainwaves and changes colour, from red to blue, to show when they’re at their most relaxed and meditative. British Airways hopes monitoring a person’s sleep and relaxation patterns during a flight will inform decisions made to improve aspects of the in-flight service; from changing the timing of meals, what food is served and even the types of films shown –to make flying and sleeping on British Airways flights even more relaxing. Last week, a group of volunteers on board the BA189 Dreamliner service from Heathrow to New York, were among the first to try out the hi-tech ‘happiness blankets’ for themselves and report on their experiences. 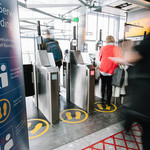 Frank van der Post, British Airways’ managing director, brands and customer experience, said: “This is the first time this technology has been used by any airline to help shape how service is delivered on board an aircraft. “You can never underestimate the importance of a good sleep so I’m looking with interest at what the British Airways ‘happiness blanket’ will reveal about the traveller’s sleep and relaxation patterns during the course of a flight.“Flying presents the body with a unique set of challenges, but getting a proper sleep on a flight isn’t rocket science. You need to ensure your brain has as few distractions as possible so that you can ease it into a different time zone. British Airways already features special in-flight podcasts to encourage customers to relax and de-stress during their flight. Last week it also announced the introduction of ‘Slow TV’ programming on board a number of its long-haul flights. The ‘wallpaper’ style footage, which features a seven hour train journey through Norway, introduces a hypnotic quality for some viewers.